Atherosclerosis is the most significant cause of cardiovascular disease worldwide. Vascular biology is the key to understanding how atherosclerosis arises and operates. 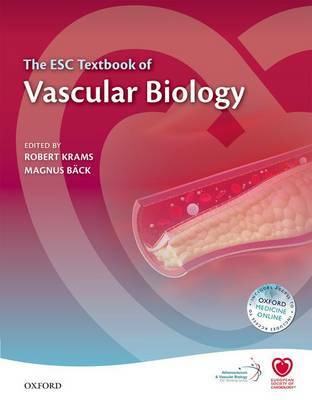 The ESC Textbook of Vascular Biology is a rich and clearly laid-out guide by leading European scientists providing comprehensive information on vascular physiology, disease, and research. The textbook covers molecular findings and novel targets within the speciality while also providing the basics of vascular biology and disease pathophysiology. It also covers the major changes in the diagnosis, prevention and treatment of atherosclerosis that have occurred in recent years, developments and recent breakthroughs in the field are specifically highlighted. The official publication of the ESC Working Group on Arthrosclerosis and Vascular Biology, this print edition comes with access to the online version on Oxford Medicine Online, for as long as the edition is published by Oxford University Press. By activating your unique access code, you can read and annotate the full text online, follow links from the references to primary research materials, and view, enlarge and download all the figures and tables. The textbook is also linked to the ESC's online learning platform (ESCel) and their core specialist training curriculum (ESC Core Curriculum). The textbook particularly appeals to vascular biologists, cardiologists, and other practising clinicians.